When North Woods Rafting began in 2002, there were only 2 rafting companies in NH and only one of them rafted NH waters – us. Owners Mark Peabody and Kimberly Hockmeyer both have experience with white water rafting. Kimberly's family owned and operated Northern Outdoors in Maine, and Mark has been a whitewater kayaking enthusiast for many years. In a small family-owned company like North Woods Rafting, you know you are getting an experience crafted by owners who are meticulous in their training techniques and employee choices. The best location and the best meals on the river! Located just 7-8 minutes from the put in on the Androscoggin River below Pontook Dam means that the stress of hurrying to gear up is non-existent, and the time spent in a vehicle is minimal. While white water rafting is an absolute blast, after a morning or afternoon on the water, guests and guides are ready to fill up their bellies! Enjoy your choice of Sirloin steak, Atlantic salmon, grilled marinated chicken, homemade potato salad, fresh garden salad and homemade cookies with lemonade served in the Mahoosuc Room. Meal is complete with great music, wonderful company and views of the Mahoosuc Range and our top fields. Relax and enjoy, with no extra cost to you. What do guides use for safety equipment? 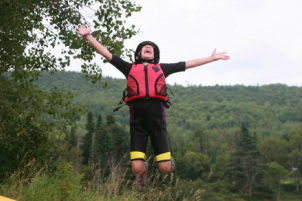 Each of North Woods Rafting’s guides is equipped with a high float Swiftwater Ranger PFD (life vest) which has safety features that allow our guides to conduct rescues on the river if necessary. Each raft is also equipped with a rescue throw rope and a comprehensive adventure first aid kit which carries everything needed in an emergency. How much time is actually spent on the water? The term half-day trips can be deceiving! Ask yourself how much time you would expect to spend white water rafting when you reserve a white water rafting trip. When you reserve a half day trip, North Woods Rafting offers 2 runs on a half-day trip (at least 2 – 2.5 hours). Ample time is spent on the water, but do keep in mind that you will be spending some quality time being shuttled to and from the river. Are helmets required for guests? Yes! We know they look goofy, but we value your brain! The Androscoggin River is a rocky river and guests can fall out of boats in the white water. We have seen people come out of the Andro with head injuries. The safest way to prevent a head injury is to wear a helmet. Do your guides wear helmets? We require our guests to wear helmets to protect their heads and we require our guides to do the same. A guide with a head injury will be no good to a boat full of guests in whitewater! How much time will I spend in rafting company vehicles? While it sounds good when a rafting company provides all transportation, that service can be less of a benefit than you might think. Every rafting company in the Great North Woods (Gorham, Berlin, Milan, Errol) rafts the same sections of river. Some companies meet you at the river and some at a rafting shop. While we are the closest as far as travel time out of all the raft companies in the area, a short ride of 8 minutes to the put in for our rafting trips, to 25 minutes to get to the put in for weekday float trips can be expected. North Woods Rafting a company vans and other vehicles are used to transport you to the river on weekend and weekday trips regardless of your location. Will my car get wet? No! Your car will be left in a safe spot and you won’t have to get in it at all in your wet rafting clothes! After rafting, we'll transport you directly to our base of operations so you can change into warm, dry clothes before enjoying your food.